A large-scale, multi-dimensional analysis of the genomic characteristics of glioblastoma, the most common primary brain tumor in adults, provides new insights into the roles of several genes and defines core biological pathways altered in tumor development . The new Cancer Genome Atlas study, published in the September 4th advanced online edition of the journal Nature, also reveals a link between the DNA repair enzyme MGMT and a hypermutation phenotype, and has potential implications for the diagnosis and treatment of glioblastoma. 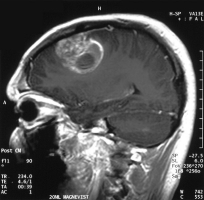 Glioblastoma is the most common and aggressive type of brain cancer. Patients newly diagnosed with glioblastoma have a median survival of approximately one year with generally poor response to therapy . Gene expression profiling studies suggest multiple subtypes of glioblastoma that, when fully defined, may allow for more personalized therapeutic approaches [3-4].